Born and raised in Central New Jersey, Pastor Jeff attended Concordia College – Bronxville, New York where he received a Bachelor of Arts degree in 1988. He attended Concordia Seminary – St. Louis, Missouri where he received his Masters of Divinity degree. During his time at the Seminary, he met his wife, Amy (Parr) during his vicarage in Boston, Massachusetts. Pastor Jeff would later participate in the Pastoral Leadership Institute (2002-2006) and complete the Doctorate of Ministry degree from Concordia Seminary in 2010. 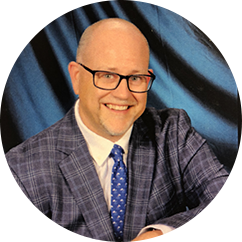 Pastor Jeff has served the following congregations: St. Matthew – Hastings-on-Hudson, NY, Redeemer – Manchester, NJ, St. James – St. James, NY, Fountain of Life – Tucson, AZ, and now serves here at Grace. Pastor Jeff and his wife Amy have two children: Madelyn (who is an Elementary school teacher) and Jarod (who serves in the United States Coast Guard). Pastor Jeff has a heart for the poor and those in need as he strives to follow the Divine Mandate of Matthew 25 and the Great Commission of Matthew 28. Born and raised in Central New Jersey, Pastor Jeff attended Concordia College – Bronxville, New York where he received a Bachelor of Arts degree in 1988. He attended Concordia Semi-nary – St. Louis, Missouri where he received his Masters of Divinity degree.